A goal of HIV-1 vaccine development is to elicit broadly neutralizing Abs (BnAbs), but current immunization strategies fail to induce BnAbs, and for unknown reasons, often induce nonneutralizing Abs instead. To explore potential host genetic contributions controlling Ab responses to the HIV-1 Envelope, we have used congenic strains to identify a critical role for MHC class II restriction in modulating Ab responses to the membrane proximal external region (MPER) of gp41, a key vaccine target. Immunized H-2d–congenic strains had more rapid, sustained, and elevated MPER+ Ab titers than those bearing other haplotypes, regardless of immunogen, adjuvant, or prime or boost regimen used, including formulations designed to provide T cell help. H-2d–restricted MPER+ serum Ab responses depended on CD4 TH interactions with class II (as revealed in immunized intra–H-2d/b congenic or CD154−/− H-2d strains, and by selective abrogation of MPER restimulated, H-2d–restricted primed splenocytes by class II–blocking Abs), and failed to neutralize HIV-1 in the TZM-b/l neutralization assay, coinciding with lack of specificity for an aspartate residue in the neutralization core of BnAb 2F5. Unexpectedly, H-2d–restricted MPER+ responses functionally mapped to a core TH epitope partially overlapping the 2F5/z13/4E10 BnAb epitopes as well as nonneutralizing B cell–Ab binding residues. We propose that class II restriction contributes to the general heterogeneity of nonneutralizing gp41 responses induced by Envelope. Moreover, the proximity of TH and B cell epitopes in this restriction may have to be considered in redesigning minimal MPER immunogens aimed at exclusively binding BnAb epitopes and triggering MPER+ BnAbs. An efficacious, protective HIV-1 vaccine will likely require the robust induction of Abs capable of neutralizing a wide array of HIV-1 isolates (i.e., broadly neutralizing Abs [BnAbs] (1). This notion is corroborated by experiments demonstrating sterilizing protection upon passive transfer of BnAbs at physiological levels, preceding SHIV challenge in nonhuman primates (2–4), or via their retroviral transduction in humanized mice, prior to HIV-1 infection (5). Unfortunately, efforts to elicit relevant BnAb titers by vaccination have been unsuccessful. Furthermore, in chronically infected HIV-1 individuals, BnAbs arise in a minority of subjects, typically years after transmission, transiently, or both (6, 7). In contrast to these rare (subdominant) BnAb responses, robust (dominant) Ab responses to nonneutralizing envelope (Env) HIV-1 epitopes are induced early in HIV-1 infection, followed by varying degrees of strain-specific or limited neutralizing Ab responses (6, 8, 9). 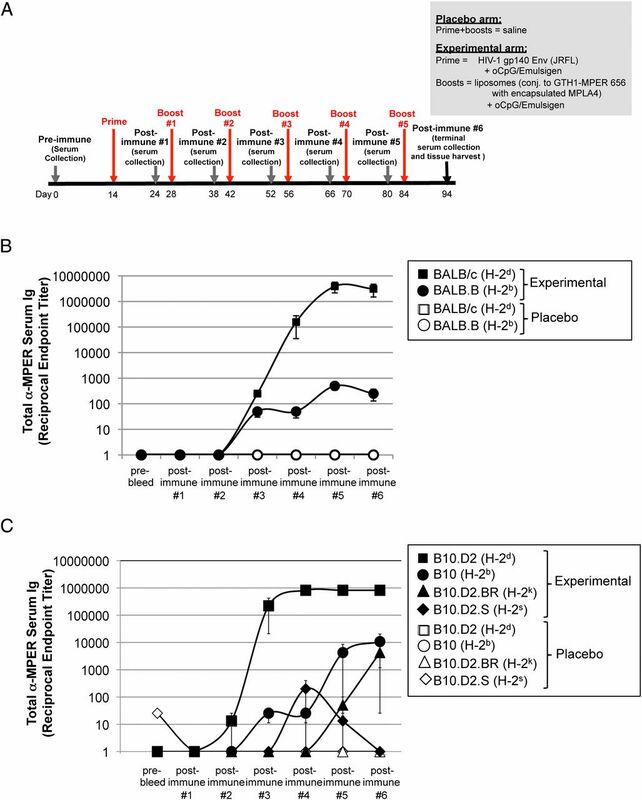 Recently, efforts to develop vaccine strategies for inducing BnAbs have been reinvigorated by advances in high-throughput recombinant Ab technology; this has led to the isolation of many novel BnAbs from chronically infected subjects and the definition of new vulnerable Env epitopes for targeting by vaccines (10). One such vaccine target is the membrane proximal external region (MPER) of gp41, a conserved region containing contiguous epitopes of several BnAbs, including 2F5, 4E10, Z13, and 10E8 (11–16). Explanations for the dearth of MPER-specific BnAbs have included limited BnAb epitope accessibility because of topological constraints in the MPER (17–22; reviewed in Refs. 23–25). We have recently demonstrated the depletion, inactivation, or modification of MPER BnAb epitope+ B cells via immunologic tolerance (26), based on two of the better-studied MPER+ BnAbs, 2F5 and 4E10, exhibiting autoreactivity/polyreactivity in vitro (27). Supporting this latter hypothesis are several observations we have made in knock-in (KI) mice expressing the original (somatically mutated) 2F5 or 4E10 V(D)J and VJ rearrangements (2F5/4E10 VH x VL KI mice): 1) expression of these rearrangements results in profound deletion of bone marrow B cells expressing them as BCRs (28, 29), akin to other KI models expressing BCRs with high affinities for self-antigens (30–32); 2) residual 2F5/4E10 KI B cells poorly express, and flux calcium through, their BCRs (28, 29, 33), thus resembling unresponsive (anergic) B cells (34, 35); 3) residual anergic B cells from 2F5 KI mice can be reawakened by a TLR agonist-MPER peptide-liposome conjugate immunogen to produce clinically relevant serum BnAb titers (36), suggesting that immunogen conformation is not limiting to elicitation of pre-existing B cells expressing BnAbs targeting the 2F5 neutralization epitope; and 4) KI mice expressing germline (unmutated) 2F5 H chains exhibit a developmental blockade at least as early and profound as those carrying the original 2F5 Ab (33, 36), suggesting that B cells in the human preimmune repertoire express unmutated 2F5 BCRs would be subjected to similar, early tolerance checkpoints. Although the above-mentioned results in our 2F5 KI model support its physiologic relevance to assess how anergic B cells can be targeted via immunization, it does not address other potentially important contributory factors limiting BnAb induction in normal, outbred animals, or healthy individuals (i.e., those with polyclonal germline [unmutated] preimmune repertoires). In this context, vaccination in rhesus macaques, using the same regimen that breaks anergy and triggers robust BnAb responses in 2F5 complete KI mice, induces Abs focused to 2F5’s core neutralization epitope DKW (14) but fails to elicit BnAb responses (37), at least partly because vaccine-elicited Abs lack somatic mutations required to either bind lipids (38, 39) or alter Ig framework regions, which might enhance neutralization breadth and potency by increasing flexibility, Env binding, or both (40). 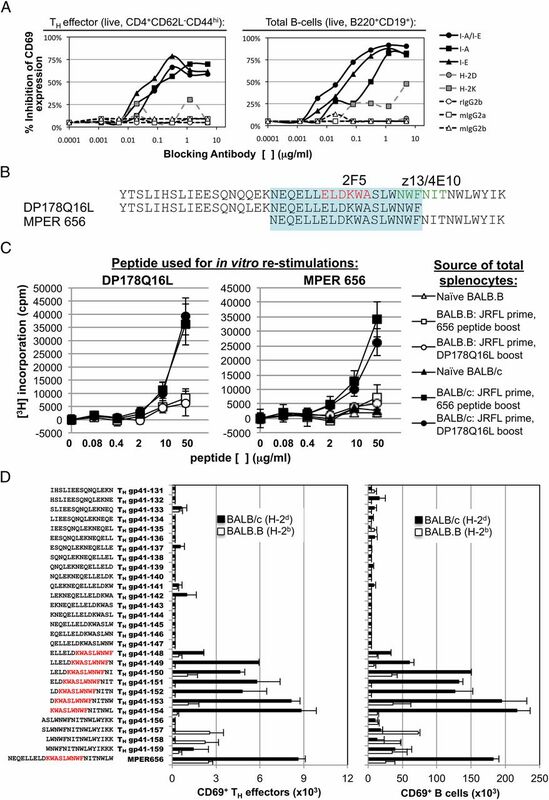 Furthermore, immunization of BALB/c mice with a similar regimen aimed at breaking tolerance induces nonneutralizing MPER+ serum IgGs (41) such as mAb 13H11, which lacks lipid reactivity (38, 41), has an MPER epitope that only partially overlaps 2F5′s (42), and binds the postfusion six-helix bundle of gp41 (43). Thus, these results reinforce the notion that overcoming B cell tolerance, although necessary, is not sufficient for overcoming subdominant MPER+ BnAb responses to immunization, and that other contributory factors are involved. One such factor may be activation of naive B cells that recognize dominant, nonneutralizing MPER epitopes by existing immunogens in preference to those recognizing subdominant BnAb epitopes (9, 10, 44). This notion is consistent with Ab responses in early HIV-1 infection being predominantly non-neutralizing, gp41 Abs+ (45–47); however, the mechanisms by which such dominant, nonneutralizing MPER+ Ab responses are preferentially triggered are unknown. In this study, we elucidate a key genetic determinant controlling nonneutralizing Ab responses directed against the 2F5 nominal MPER epitope: MHC class II–restricted TH activation. Unexpectedly, this restriction involves presentation by I-E/I-Ad alleles, to CD4 TH cells, of a core epitope found in the MPER that overlaps the 2F5/z13/4E10 BnAb epitopes (11, 14, 16) and residues associated with nonneutralizing Ab binding (39, 42, 48). We propose that this dominant class II–restricted MPER+ response contributes to the general heterogeneity of nonneutralizing gp41 responses seen in acute HIV-1–infected patients and vaccinated animals. Furthermore, understanding the collaboration of TH and B cell epitopes involved in this restriction will likely be critical for engineering gp41 MPER immunogens with modified TH/B cell epitopes, to selectively drive subdominant MPER+ BnAb responses. Liposome or peptide immunogen components, or both, were produced, purified, formulated, and used in immunization formulations described below, based on previously described methods (36, 37). Peptide synthesis and purification was performed by CPC Scientific (Sunnyvale, CA) and TLR agonist-containing MPER peptide-liposome conjugates were constructed using the adjuvant MPL-A (Avanti Polar Lipids, Alabaster, AL), POPC/POPE/DMPA/CH-containing liposomes, and the 2F5 nominal epitope-containing MPER peptide GTH1-MPER 656 peptide (NEQELLELDKWASLWNWFNITNWLWYIK YKRWIILGLNKIVRMYS), a version of MPER 656 synthesized containing the C-terminal hydrophobic lipid membrane-anchoring tag GTH1 (YKRWIILGLNKIVRMYS). Female C57BL/6, BALB/c, BALB.B, B10.D2, B10, B10.D2.BR, B10.D2.S, inbred mouse strains were purchased from Charles River Laboratories or the Jackson Laboratory. 2F5 complete (VH+/+ x VL+/+) KI mice were described previously (28). All strains used in this study were 8–12 wk old at the start of immunization protocols and housed in the Duke University Animal Facility in a pathogen-free environment with 12-h light/dark cycles at 20–25°C under American Association of Laboratory Animal Care guidelines and in accordance with all Institutional Animal Care and Use Committee and Duke University Institutional Biosafety Committee–approved animal protocols. For all immunizations, a minimum of 4 mice per group were used, and single-site injections were administered intraperitoneally at day 0 and weeks 2, 4, 6, 8, and 10. Prior to immunizations, either purified recombinant JRFL gp140 or MPLA-MPER 656 peptide-liposome conjugates, described above, were formulated in 10% Emulsigen (MVP Technologies, Omaha, NE) and oCpG (Midland Certified Reagent Company, Midland, TX). Placebo immunization groups received 200 μl of 1× saline (for both priming and boosting injections), whereas experimental groups received 200-μl injection volumes of JRFL/Emulsigen/oCpG for priming (corresponding to 25 μg JRFL and 10 μg oCpG), and for most studies unless otherwise noted in the main text, 200-μl injection volumes of MPER 656 peptide-MPLA4-liposome conjugates for boostings (corresponding to 25 μg GTH1-MPER 656 peptide, 10 μg MPLA-4, and 10 μg oCpG). For control TNP immunizations, naive animals were injected i.p. with 0.2 ml containing 50 μg trinitrophenyl hapten 12-keyhole limpet hemocyanin (TNP-KLH; Biosearch Technologies, Novato, CA) precipitated in alum in saline. Other adjuvant and peptide–protein immunogen combinations tested in our initial comparisons reported here (Tables I, II) have been described previously, as detailed in the table footnotes. For all immunization studies, serum samples were collected 10 d after each immunization and stored at −80°C until further use. Proliferation of primed splenic CD4 TH cells in response to restimulation with MPER peptides was measured either by [3H] incorporation assays of purified CD4 T cells in the presence of APCs or by flow cytometry–based detection of BrdU and CFSE incorporation or CD69 expression in splenic CD4 TH cell. For [3H] incorporation assays, splenic CD4 T cells (taken 10 d after fifth boosts) were purified using a CD4+ T cell Isolation Kit II (Miltenyi Biotec). LPS activated splenocytes (2 d), purified naive B cells or non–B cells were treated with 50 μg/ml mitomycin C, washed three times with complete RPMI media (RPMI 1640, 10% FCS, β-ME and penicillin/streptomycin antibiotics) were used as APCs. CD4 cells (2 × 105/well) were incubated with APCs (8 × 105/well) or 5 μM MPER656 peptide, or both, in 96-well plates in complete RPMI media, and incubated at 37°C with 5% CO2. After 4 d, 1 μCi/well [3H]thymidine (PerkinElmer) was added, and cells were incubated for an additional 6 h. Cells were measured for thymidine incorporation using a Microβ counter (PerkinElmer). For CFSE dilution and CD69 induction analysis of CD4 T cell subsets (and total B cells), primed splenocytes (5–10 d after fifth boosts) were collected, RBC lysis was performed using ACK Buffer (Life Technologies). After resuspension in HBSS with 0.1% BSA at 107 cells/ml, cells were incubated with 5 μM CFSE (Life Technologies) at 37°C for 10 min, and immediately quenched using 10 volumes of RPMI-FCS, followed by washing 3× in RPMI-FCS. In vitro restimulation was performed by incubating 107/ml CFSE-labeled splenocytes with MPER peptides, and in some cases, superantigens (staphylococcal enterotoxin A and B, toxic shock syndrome toxin-1; Sigma] for indicated periods, using complete RPMI media. T cell subsets and total B cells in CFSE-labeled, restimulated, primed splenocytes were then fractionated by staining with the Live/Dead Yellow Fixable Dead Cell Stain Kit (Life Technologies). Cell pellets were washed in PBS and incubated for 30 min in stain buffer (1% BSA in HBSS) with anti–CD4-PerCPcy5.5 (RM4-5), anti–CD44-APC (IM7), anti–CD62L-PE (MEL-14), anti–CD69-PEcy7 ([1H].2F3), anti–CD8-AF700 (53-6.7), and B220-PETexRed (RA3-6B2), all purchased from BD Biosciences. Live T cell subsets and total B cells were analyzed using a BD LSR-II (BD Biosciences) and FlowJo software (Tree Star). CD69 gating baseline was set based on cells without in vitro peptide stimulation, from naive (unimmunized) mice. Peptide-specific TH effector (CD62L−CD44hiCD69+) numbers were calculated by subtracting those restimulated with peptide from those that were unstimulated. Flow staining measurements of IFN-γ secretion and BrdU incorporation in CD4 TH effector subsets was performed using a BrdU Flow Kit (BD Biosciences). Splenocytes (107/ml) 10 d after fifth boosts were incubated with MPER 656 peptide in complete RPMI media for 48 h. During the last 6 h before harvest, BrdU and GolgiStop (BD Biosciences) were added to the culture media. Cells were harvested, incubated with the Live/Dead Yellow for 30 min, and washed with PBS. CD4 T cell subsets were then fractionated by surface staining, as described above. After fixation and permeabilization, cell pellets were digested with DNase and stained with anti–Brdu-V450 (3D4) and anti–IFN-γ–APC (XMG1.2) according to the manufacturer’s instructions (BD Biosciences). Peptide-specific TH effector CD4 cells were calculated by determining total numbers of CD62L−CD44hi BrdU+ or CD62L−CD44hi IFNγ+ cells (restimulated with peptide, subtracted from background). Abs specific for MHC I H-2Dd (34-2-12), H-2Kd (SF1-1.1), or MHC II I-A/I-E (M5/114.15.2), I-Ad (AMS-32.1), I-E (14-4-4S), as well as the corresponding isotype controls rat IgG2b (A95-1), mouse IgG2a (G155-178), and mouse IgG2b (MPC-11), were purchased from BD Biosciences. ACK-treated splenocytes were incubated with the above Abs for 1 h, followed by MPER 656 peptide stimulation in complete RPMI media at 37°C with 5% CO2 for an additional 16 h. Ab inhibition was calculated by the percentage decrease of CD69+ MPER 656 peptide-specific TH cells, relative to those in the absence of blocking Abs. For TH epitope mapping studies, ACK-treated, primed splenocytes from immunized BALB/c (H-2d) or BALB.B (H-2b) mice were incubated with single amino acid overlapping 15-mer MPER peptides spanning gp41 132-159 (as denoted in Fig. 5D) in complete RPMI media at 37°C with 5% CO2 for 24 h. TH effector and total B cells from primed splenocytes were then subfractionated by cell surface staining analysis as described above, and the relative ability of peptides to restimulate each population was measured by CD69 expression, also as described above. Overlapping peptides were synthesized and purified by CPC Scientific (Sunnyvale, CA); to improve solubility, one or two K residues were added to the C termini of MPER peptides spanning the gp41 155-159 region (i.e., TH gp41 156-159). TH gp41-155 could not be synthesized because of solubility issues. 2F5 epitope-specific MPER-specific serum Ab ELISAs and surface plasmon resonance (SPR) measurements of mAb or serum interactions with the 2F5 epitope were determined as described previously (28, 36, 37, 39, 48). ELISA measurements of MPER-specific serum Ab titers were determined using high-binding microtiter plates coated at 0.2 μg/well with the 2F5 nominal epitope-containing peptide SP62 (QQEKNEQELLELDKWASLWN) corresponding to residues 659–678 of the HIV-1 envelope, and SP62-specific total Ig, IgM, or IgGs were detected using AP-conjugated anti-mouse κ, μHC, or μHC-specific reagents, respectively. For SPR assays, the mouse IgG1 anti-gp41 MPER-specific cell line 13H11 was grown and maintained in DMEM media (Life Technologies) containing 10% FCS, 2-ME and penicillin/streptomycin antibiotics as described previously (41) and purified m2F5 and 13H11 mAbs were confirmed by running fragments on reducing/nonreducing gels and staining with Coomassie Blue. 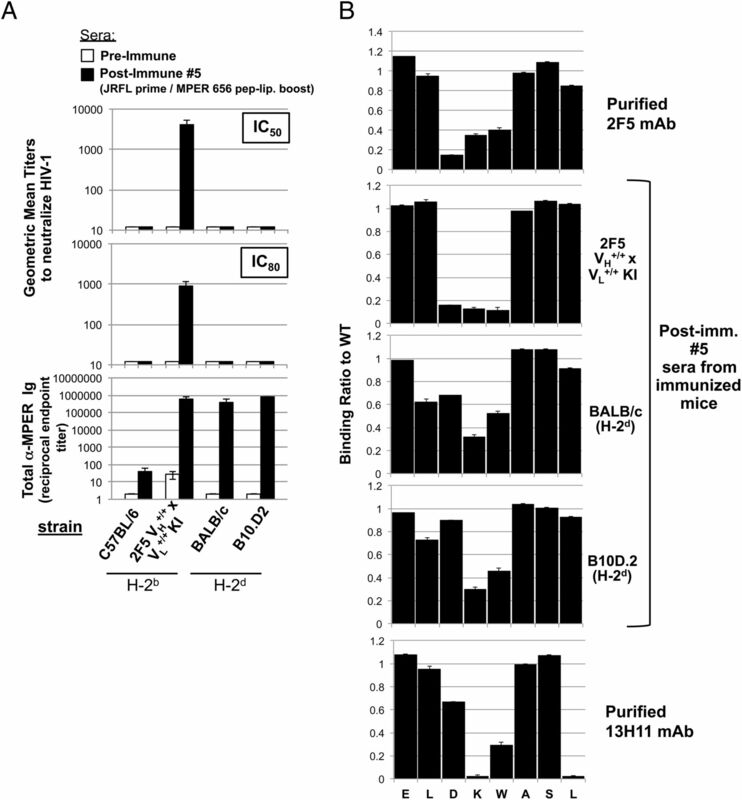 All SPR measurements of mAb or serum interactions with the gp41 MPER wild type (WT) or mutant peptides spanning the 2F5 epitope were conducted on a BIAcore 4000 instrument, and data analyses, including affinity measurements, were performed using the BIAevaluation 4.1 software (BIAcore), as previously described (28, 36, 37, 39). TNP-specific serum Ab titers were determined by ELISA using plate-coated TNP-BSA (0.2 μg/well; Biosearch Technologies, Novato CA) and AP-conjugated anti-mouse IgG (Southern Biotech, Birmingham, AL). HIV-1 neutralization was determined using the TZM-b/l pseudovirus infectivity assay as described previously (28, 49), using the HIV-1 isolate B.MN.3, which we previously showed is a reliable and sensitive method for screening m2F5 IgG neutralization activity in mouse serum (36). Statistics were performed with either Excel (Microsoft) or GraphPad (Prism) software to determine p values by paired Student t test. We initially observed differences in the magnitude of 2F5 nominal MPER epitope-specific (herein designated MPER+) Ab responses in a series of parallel immunization studies in BALB/c and C57BL/6 mouse strains, using various combinations of adjuvants and HIV-1 immunogens (Table I). In these studies, BALB/c mice invariably had a 2–6 log higher peak MPER+ serum Ab titers than those of C57/BL6 mice, despite variations in peak titers of both strains that depended on the adjuvant being used (oCpG, Ribi, MPLA, Alum), the presence or absence of priming gp140 Env immunogen, or the form of MPER immunogen being used (peptides or peptide-liposome conjugates). Because we reported previously that the IgHa allotype restricts the degree of naive IgM+ B cell interactions with the 2F5 nominal epitope (48), we first tested whether IgH allotype drives MPER+ Ab responsiveness. We found no significant differences between immunized IgH congenic strains in titers of MPER+ total serum Ig (Supplemental Fig. 1A) or MPER+ serum IgM and IgG (Supplemental Fig. 1B), nor in distributions of total serum Ig isotypes and subclasses (Supplemental Fig. 1C). From these results, we conclude that magnitude and isotypic distribution of MPER-specific Ab responses to Env immunization are not effected by IgH allotype. Because we previously noted that several other strains sharing the same MHC haplotype (H-2d) as BALB/c mice also exhibited robust MPER+ serum Ab responses, we formally tested whether MHC restriction was involved in driving the magnitude of MPER+ Abs. For this test, we compared MPER+ serum Ab responses in BALB/c (H-2d) and BALB.B (H-2b) strains (the latter sharing the same haplotype as the C57BL/6 “low responders”; Table I), immunized with either a placebo (saline) regimen or an experimental regimen (involving priming with gp140 Env, then boosting with a [TLR4/9 agonist-MPER peptide-liposome] conjugate immunogen; Fig. 1A), a regimen which elicited the highest peak MPER+ serum Ab titers across C57BL/6 and BALB/c strains (Table I; lower row). As expected, significantly lower titers of MPER+ serum Abs were seen in immunized BALB.B, relative to BALB/c mice (Fig. 1B). As in our comparisons of C57BL/6 (H-2b) and BALB/c (H-2d) strains, the same relative differences in MPER+ Ab magnitude were observed in BALB.B (H-2b), and BALB/c (H-2d) strains, regardless of adjuvant and immunogen combinations used for immunizations (Table II), but the experimental (JRFL prime/TLR-MPER peptide-liposome boost) regimen again induced the highest peak MPER+ serum Ab titers across both MHC congenic strains (Table II; lower row). This regimen has also been shown to induce robust serum MPER+ Ab titers in 2F5 KI mice (36), as well as MPER+ Ab responses focused on the 2F5 (DKW) neutralizing residues in rhesus macaques (37); therefore, it is used in all subsequent immunizations in this study (unless otherwise noted). MHC-dependent MPER+ Ab responses are observed in two independent series of MHC haplotype-congenic mouse strains. (A) Experimental design of immunization studies. Shown are the placebo (saline) and experimental (JRFL prime, [TLR4/9-MPER peptide-liposome] conjugate immunogen boost) arms and the study schedule, including timing of prime or boosts, serum collections, and harvests. Note that because the highest peak MPER+ Ab titers were observed in all strains using the experimental regimen shown (i.e., relative to other adjuvant–immunogen combinations tested; Tables I, II), it is used in all other results in this study (i.e., unless otherwise noted). (B) ELISA measurements of total MPER (2F5 epitope)-specific serum Ig (κ) responses (mean ± SEM) in BALB/c and BALB.B congenic mice, were measured against plate-bound 2F5 nominal epitope-containing peptide SP62, and calculated as reciprocal endpoint titers, as described previously (28) and in the Materials and Methods. Data are shown as mean ± SEM reciprocal endpoint titers of individual mouse serum samples at various serum collection times (using greater than three individual mice per time point) during course of immunization protocol. (C) ELISA measurements of MPER-specific serum Ig levels in a B10.D2 series of MHC haplotype congenic mice, measured and represented as in (B). Since it has been reported that HIV-1 Env responses to immunization are Th2-polarized (50–53), that we note differential responsiveness in MHC congenic strains on a BALB (Th2) background demonstrates that Th2-related effects cannot exclusively be responsible, but it does not rule out their involvement. To formally exclude this possibility, and to extend our results across several other MHC haplotypes, we immunized a separate series of congenic strains, on a Th1-biased background (B10), bearing H-2d, H-2b, and two other MHC haplotypes (H-2s and H-2k). Only B10.D2 (H-2d) mice had high MPER+ serum Ab responses, whereas those bearing other haplotypes had low or no responses (Fig. 1C). From these experiments, we conclude that in normal mice, MPER+ serum Abs elicited in response to immunization with MPER immunogens are restricted by MHC haplotype, with H-2d specifying more rapid and higher titers, regardless of the regimen being used. The fact that serum Abs elicited in BALB/c and B10.D2 “high responder” strains were predominantly IgG (Supplemental Fig. 1) and were long lasting, as determined by their persistence several weeks after immunization suggested a requirement for TH-MHC class II interactions in H-2d–restricted MPER+ serum Ab responses. To test this possibility genetically, we examined MPER+ serum Ab responses in MHC H-2d/b intracongenic B10 strains (i.e., differing in H-2d and H-2b haplotype at class I and II alleles; Fig. 2A). Indeed, MPER+ serum Ab responses in immunized B10.HTG mice (an intracongenic strain bearing I-Ad/I-Ed class II and Db/Lb class I alleles) were comparable to those in the parental responders (B10.D2), whereas those in immunized B10.D2-H2 mice (an intracongenic strain bearing I-Ab/I-Eb class II and Dd/Ld class I alleles) were comparable to MPER+ serum Ab responses in the nonresponder (B10) strain (Fig. 2B). These results strongly suggest involvement of MHC class II–restricted, CD4 T cells in MPER+ serum Ab responses, but they cannot formally rule out a role for the H-2K class I allele, because no H-2d/b intracongenic linkage strains exist between it and class II alleles. 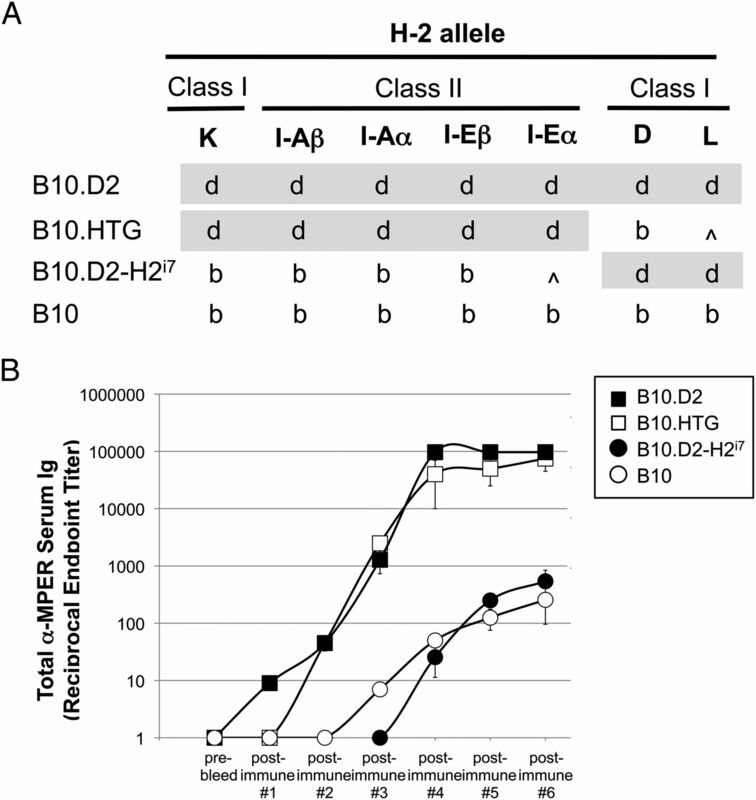 MPER+ Ab responses in MHC H-2b/H-2d haplotype intracongenic strains. (A) Linkage chart of strains, showing MHC haplotypes at various MHC alleles. (B) MPER+ Ab responses in immunized haplotype intracongenic strains, measured in the same manner as those shown in Fig. 1. To exclude this possibility, we crossed BALB/c mice to CD154−/− mice (i.e., deficient in expression of CD40L and incapable of responding to cognate CD4 T cell help) and immunized them with our experimental (JRFL prime, TLR-MPER peptide-liposome boost) regimen. As would be expected if MPER+ Ab responses in MHC (H-2d) responder strains were CD4 TH dependent, immunized BALB/c x CD154−/− mice had profound reductions in MPER+ serum Ab responses, relative to BALB/c mice on CD154-sufficient backgrounds (Fig. 3A). These reductions were as significant as TNP-specific Ab responses in C57BL/6 (H-2d) and BALB/c (H-2b) mice on CD154-deficient backgrounds, immunized with TNP-KLH (a control immunization to elicit TH-dependent, non–MHC haplotype-restricted Ab responses). Furthermore, the higher proportion MPER+ IgG+ B cells present in MPER-immunized responder (H-2d) strains, were also significantly reduced in those on CD154-deficient backgrounds, comparable with reductions in TNP-specific IgG+ B cells from TNP-KLH–immunized H-2b and H-2d CD154−/− mice (Fig. 3B). Together, these results demonstrate a role for class II haplotype-specific interactions with CD4 TH epitopes in specifying MPER+ Ab responses. MPER+ Ab and splenic B cell responses in the MHC H-2d responder haplotype require cognate CD4 T cell help. (A) WT or CD154 knockout (CD40L−/−) mice on BALB/c (H-2d) or C57BL/6 (H-2b) backgrounds were immunized with either control (50 μg TNP-KLH plus Alum) or experimental (JRFL/TLR4/9-MPER peptide-liposome boost) regimens, as described in Materials and Methods and Fig. 1, respectively. All control and experimentally immunized groups were measured for both MPER+ and TNP+ Ab responses, as revealed by α-IgG-AP detection of plates coated with the 2F5 nominal epitope peptide SP62 or TNP-BSA, respectively (and as described further in Materials and Methods). 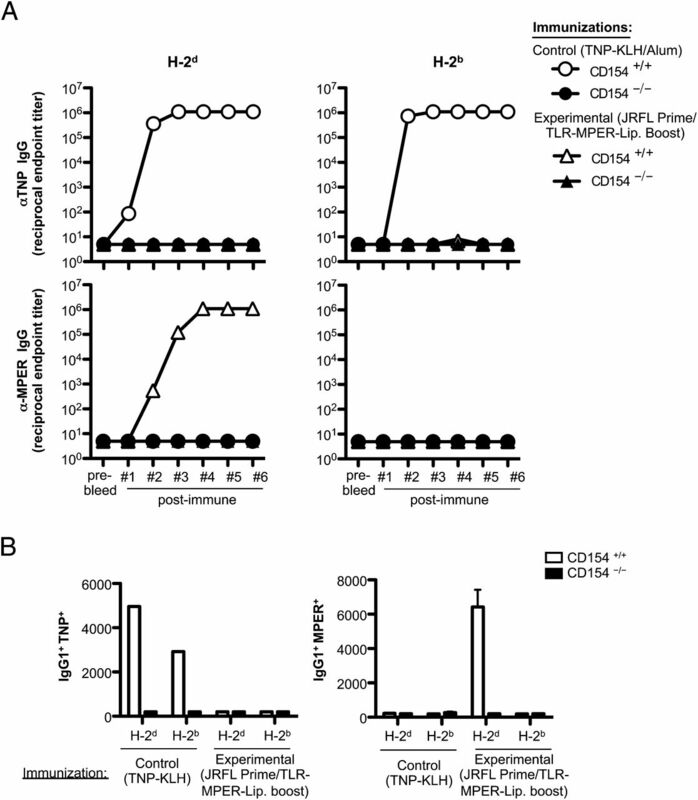 (B) CD154-dependent H-2d–restriction of MPER-specific IgG+ B cells in immunized mice. Shown are graphical representations of TNP or MPER-specific IgG1+ B cells per 106 total (singlet, live, κ+ gated) splenic B cells from BALB/c (H-2d) and C57BL/6 (H-2b) mice (on either CD154-sufficient or deficient backgrounds), immunized with control (TNP-KLH) or experimental (JRFL prime/TLR-MPER peptide-liposome boost) regimens. For all data shown, splenocytes were taken 10 d after fifth immunizations and two or more mice per immunization group are shown. MPER-specific B cells were measured by 2F5 nominal MPER epitope (SP62) tetramers, as described previously (28, 44), whereas TNP-specific cells were enumerated by TNP-fluorescein-AECM-FICOLL as described in Materials and Methods. Similar differences in total and MPER-specific IgG1+ splenic B cells were also seen between immunized BALB/c (H-2d) and BALB.B (H-2b) congenic MHC strains on CD154-sufficient backgrounds (data not shown). To characterize further the role of MHC class II–TH interactions in MPER+ responses, we examined primed CD4 T cell responses restimulated in vitro with MPER (2F5 epitope-containing) peptides. First, we isolated splenocytes from immunized BALB/c (H-2d) and BALB.B (H-2b) mice at peak serum Ab induction (i.e., 5–10 d after fourth boosts; Fig. 1B), separated splenic CD4+ T cells at high purity (Supplemental Fig. 2A), restimulated them in vitro for 4 d with MPER peptides in the presence of haplotype- matched accessory cells, and compared their ability to proliferate in 3H incorporation assays. Only H-2d–restricted CD4 T cells, in the presence of MPER peptides and LPS-activated accessory splenocytes, exhibited significant proliferation, suggesting a requirement for activated B cells as APCs (Fig. 4A). H-2d–restricted proliferation in CD4+ T cell subsets was then further examined by obtaining total splenocytes from BALB/c and BALB.B mice (also 5–10 d after fourth boosts), restimulating them in vitro with MPER peptides, and measuring CFSE dilution in CD4 TH naive, effector, and memory subsets, which were differentiated by gating on surface expression of CD44 and CD62L (l-selectin) by flow cytometry (Supplemental Fig. 2B). We found that primed CD4+ TH effector (CD44hi, CD62Llo) and memory (CD44int/hi, CD62Lint/hi) subsets from H-2d–restricted mice had significantly elevated MPER-specific and baseline proliferation (i.e., low CFSE dilution), relative to those from H-2b–restricted mice (Fig. 4B). MPER-dependent CD4 TH activation, proliferation, and IFN-γ secretion in MHC H-2b and H-2d congenic strains. (A) MPER-induced proliferation of purified CD4 cells from immunized BALB/c and BALB.B mice (taken 10 d after fifth immunizations with experimental regimen). In vitro restimulations were done using 5 μM of the MPER 656 peptide with the various denoted cell fractions used as APCs, and proliferation was measured by [3H]-thymidine incorporation, as described in Materials and Methods. The CD4 T cell proliferation index shown was calculated as the cpm ratio of peptide restimulated groups: control (unstimulated) groups. (B) MPER-dependent proliferation of CD4 splenic subsets from immunized mice (10 d after fifth immunizations with the experimental regimen) was measured by CFSE analysis. Numbers shown represent the percentage of dividing cells (i.e., denoted CFSE low). (C) MPER-dependent TH effector activation (CD69 expression), proliferation (BrdU incorporation), and cytokine expression (IFN-γ intracellular staining) were measured by flow cytometry. Numbers shown are MPER-induced TH effector CD4 cells per 106 total CD4 cells. As the primed TH effector subset had the highest percentage of peptide-specific, proliferating cells, and were therefore readily trackable, we examined several other well-described functional parameters of proliferation and activation in this subset by flow cytometry, after restimulation of primed splenocytes (taken 4–7 d after fourth boosts from both haplotype congenic strains). These parameters included IFN-γ production by intracellular cytokine staining, surface expression analysis of the early activation marker CD69, and BrdU incorporation (an additional measure of cell proliferation/turnover). As expected, all were elevated in MPER peptide–restimulated, primed H-2d–restricted TH effector populations, relative to those that were H-2b–restricted (Fig. 4C). Consistent with TH-dependent proliferation and activation of B cells, increases in the proportion of dividing cells (i.e., having low CFSE incorporation) and CD69 expression by total (CD19+B220+) B cells from primed, MPER peptide-restimulated H-2d–restricted splenocytes was also observed (Supplemental Fig. 3). To assess whether MPER-specific Abs elicited by immunization in high-responder (H-2d) strains had any detectable HIV-1 neutralizing activity, we compared the ability of serum Abs from immunized BALB/c and B10.D2 mice to neutralize the 2F5-sensitive, Tier 1 HIV-1 isolate B.MN.3 in the TZM-b/l pseudovirus assay (49). As a positive control for neutralization by serum Abs from immunized mice, we used similarly immunized 2F5 “complete” KI mice, whose B cells have been engineered to express the VH/VL pair of the original 2F5 mAb (28) and that we have recently shown can generate robust titers of potently neutralizing MPER+ serum Abs on the B6 (H-2b) background (36). In this system, it is important to point out that equally potent responses can be generated on either CD154-sufficient or -deficient backgrounds, consistent with being generated in an exclusively T-independent manner, under conditions where immunodominant nonneutralizing responses are not favored (36). We found that although immunized H-2d congenic strains had peak MPER+ serum Ab titers comparable to those from immunized 2F5 complete KI mice (Fig. 5A; lower panel), they exhibited no significant neutralization activity (Fig. 5A; upper panels). Neutralization activity and MPER epitope specificity of MHC-restricted MPER+ serum Ab responses elicited by vaccination. (A) Serum neutralizing Ab induction in immunized “high responder” (H-2d) congenic B10 and BALB strains was measured at peak MPER+ serum Ig induction (10 d after fifth immunizations with experimental (JRFL prime/TLR4/9-MPER peptide-liposome boost) regimen, or as a negative control in preimmune sera, using the HIV-1 B.MN.3 isolate in the TZM-b/l neutralization assay (28, 53). Shown are GMTs of reciprocal dilutions of sera to inhibit HIV-1 B.MN.3 at 50 or 80% levels (top panels) and corresponding MPER (2F5)-specific Ig levels (calculated and represented as in Fig. 1B–C as reciprocal endpoint titer means ± SEMs (bottom panel). Data shown use sera taken from greater than three mice per group assayed. For comparison, also shown as controls are the (H-2b) “low-responder” C57BL/6 strain and 2F5 complete KI mice (on the C57BL/6 background). (B) SPR epitope mapping of serum taken from immunized “high responder” (H-2d) congenic B10.D2 and BALB/c strains, measured at peak MPER+ serum Ig induction (10 d after fifth immunizations with experimental regimen). Shown are SPR sensograms of serum Ab binding to WT or mutant alanine scanning SP62 (2F5 epitope-containing) peptides, represented as normalized binding (i.e., ratio between binding responses of sera to the alanine scanning mutant and WT SP62 peptides). As controls for specificity to the 2F5 neutralizing core DKW, also shown are binding profiles of 10 μg/ml purified mAbs 2F5 and 13H11 (upper and lower panels respectively). All serum Ab binding data shown are representative of measurements of individual samples repeated in two independent experiments using greater than two mice per group assayed. To determine specificity of H-2d–restricted serum Ab responses, we performed fine specificity mapping of serum samples from immunized BALB/c and B10.D2 strains at their peak induction (after fifth boosts) by surface plasmon resonance analysis. Strikingly, we found that serum Abs had significantly decreased specificity for the aspartate residue in the DKW neutralization core of 2F5 (Fig. 5B). In contrast, serum Abs derived from 2F5 complete KI mice, like the original 2F5 BnAb, exhibited fine specificity for all three neutralization core residues, consistent with potently neutralizing HIV-1 MN. Also noteworthy is that—despite their reduced specificity for gp41664 in the DKW neutralization core—serum from H-2d strains immunized with MPER peptide-liposome conjugates are more focused to the neutralization core than 13H11, a nonneutralizing mAb that was also derived from BALB/c (H-2d) mice that were immunized instead with Env protein (41, 43). This likely reflects the general ability of the MPER peptide-liposome immunogen to focus the MPER+ Ab response to the DKW core (37), because MPER epitopes, only when presented in lipids, selectively bind 2F5 and 4E10 but not 13H11 (38, 54). To understand the mechanism by which MHC class II restricts MPER-specific responses, we examined MPER-specific induction of CD69 expression in TH effector CD4+ and total B cell populations within primed splenocytes from immunized BALB/c (H-2d) responder strain that were restimulated overnight with MPER peptides, either alone or in the presence of various α-H2 class I, class II, or isotype control Abs (Fig. 6A). As expected, all α-class I Abs minimally inhibited MPER-specific CD69 expression whereas a general α-class II (i.e., α-I-E/I-A) blocking Ab (as well as Abs specific for I-A or I-E alleles) had a dramatic effect at subsaturating concentrations, indicating a critical role of both class II alleles in abrogating MPER-specific CD69 expression in TH effector CD4+ and total B cells (Fig. 6A). MHC class II–restricted MPER responses map to the core TH epitope KWASLWNWF. (A) Inhibition of MPER-dependent activation (CD69 expression) of splenic TH effector CD4 cells or total B cells by MHC class I or II blocking Abs. Cells were taken 10 d after fifth immunizations, and pooled from five BALB/c mice. Data are representative of three independent experiments. (B) Overlapping peptides DP178Q16L and MPER 656 were used as immunogens and for in vitro restimulations. The core neutralizing epitopes of the 2F5 and 4E10 BnAbs are shown in red or green lettering, respectively, and the region to which MPER restimulations map are represented in blue shading. Also shown for reference is the SP62 peptide, used for measuring ELISA serum Ig titers in this study. (C) MPER peptide-induced proliferation of splenocytes from immunized mice (10 d after fifth immunizations) was measured by [3H]-thymidine incorporation. Data are shown as mean ± SEM of cpm (greater than three individual mice). (D) TH epitope mapping with overlapping peptides spanning the MPER region. Activation of TH effector CD4 cell or B cell populations from BALB/c (H-2d) or BALB.B (H-2b) primed splenocytes (pooled from five mice per strain), in vitro–stimulated with 5 μM of MPER peptides, was measured by CD69 surface staining. Shown are the numbers (mean ± SEM) of CD69+ MPER-activated TH effectors per 106 total CD4+ cells (left panel) or CD69+ MPER-activated B cells per 106 total (B220+) B cells (right panel). Sequences of overlapping peptides for mapping are shown to the left, with residues defining the TH core epitope indicated in red letters. Results are representative of two independent experiments. To examine the region where class II haplotype-restricted MPER responses map, we used a set of overlapping peptide immunogens: DP178Q16L and MPER 656 (spanning N- and C-terminal portions, respectively) of a stretch in the gp41 MPER HR2 region (gp41145-163) overlapping the 2F5, 4E10, and z13 BnAb neutralization epitopes (Fig. 6B). Because these overlapping peptides have been used extensively in our various previous immunization studies (Tables I, II), we used them to immunize BALB/c (H-2d) responders (and as controls, BALB.B [H-2b] nonresponders) and then again to restimulate total primed splenocytes from these mice to assess relative proliferation by 3H incorporation. We found that the MPER 656 peptides could restimulate DP178Q16L-immunized responder splenocytes and, conversely, that DP178Q16L peptides restimulate MPER 656-immunized responder splenocytes (Fig. 6C). These results identified an 18-aa overlapping region (which includes the 2F5 nominal epitope and partially overlaps the z13/4E10 epitopes) that is responsible for MHC-restricted MPER+ responses (Fig. 6C, highlighted region). We then formally fine-mapped the functional responsiveness of this region using 15-mer peptides, overlapping by single residues spanning the entire 18-aa stretch to restimulate primed splenocytes from immunized BALB/c responder mice, after which CD4+ TH effector cell activation was measured using CD69 expression as the readout (Fig. 6D, left panel). Using this approach, we identified a specific region (gp41154–163) to which activation localized, thus representing the core TH epitope for H-2d restriction: KWASLWNWF. This same core was observed in the activation (i.e., induction of CD69 surface expression) of primed total (CD19+B220+) B cells (Fig. 6D, right panel). The KWASLWNWF sequence contains portions of the 2F5 (KWA) and 4E10/z13 (NWF) nominal MPER epitopes ELDKWA and NWF(N/D)IT, respectively (11–16). In this study, we uncover a key genetic determinant affecting MPER (2F5 nominal epitope)-specific IgG Ab titers elicited: MHC class II haplotype restriction of CD4 TH responses. By demonstrating that this restriction occurs in immunized MHC congenic strains on both BALB and B10 backgrounds (with Th1 and Th2-polarized responses, respectively), our study excludes effects related to the general Th2-bias of α-Env IgG responses previously noted during HIV-1 infection (55, 56), and in HIV-1 vaccination of mice and humans (50–53). Our results also rule out IgH allotypic effects, which we previously demonstrated affect nonparatopic, low-affinity interactions of the nominal 2F5 MPER epitope with IgM+ splenic B-cells/mAbs in naive mice (48). Because it is not clear whether IgH allotype affects affinity or specificity of such nonparatopic interactions, in finding no effect of IgH allotype on MPER+ Ab titers/isotypic distribution, our study does not exclude its role in nonneutralizing Ab specificity (i.e., by altering signal strength of nonparatopic interactions). In this regard, SPR fine-mapping analysis of serum Abs from immunized IgH congenics on responder (H-2d) MHC backgrounds should be informative. This study also reveals the atypical nature of TH and B cell collaboration involved in gp41-specific Ab induction. In particular, our functional mapping of the core TH epitope (KWASLWNWF) responsible for the H-2d restriction of MPER+ Ab responses to a region in our minimal MPER immunogens that overlaps several B cell epitopes—including those bound by BnAbs 2F5 (14), z13 (16), and 4E10 (11, 15) and residues involved in nonneutralizing, nonparatopic interactions (42, 43, 48)—contrasts the widely-held notion that TH and B cell epitopes generally do not overlap (57–59) and would be disadvantageous for B cell immunogenicity, because of either the competition of BCR and class II molecules for Ag binding (60) or the former interfering with endocytosis-Ag processing by the latter (61, 62). The generality of this notion, however, has been challenged in later studies (63–68). Regardless, given the polyreactive and/or autoreactive nature of MPER+ BnAbs (10, 27–29, 33), it is interesting that among notable examples of overlapping B-TH epitopes, those involved in autoantibody responses are prominently represented (reviewed in Ref. 69), with the best characterized of these being against the T1 diabetes autoantigen I-A2 (70). Further highlighting the unusual nature of TH–B cell collaboration in MPER+ Ab responses to immunization, our study also demonstrates elevated MPER+ Ab titers in immunized H-2d congenic strains, irrespective of whether a lipid-anchoring tag (GTH-1) derived from an α-helical region in HIV-1 p24 gag (71) or a gp140 Env protein immunogen are used. Because the former contains an immunodominant TH epitope (38) and the latter contains multiple non haplotype-restricted TH epitopes with considerably higher predicted binding affinities than the I-Ad-restricted, functionally-mapped core TH epitope KWASLWNWF (based on the MHC2PRED algorithm) (72), it is strongly suggested that general TH cross-presentation cannot replace MPER+ Ab induction specified by this restricted TH epitope, and therefore contrasts the general notion of significant plasticity/considerable promiscuity existing in CD4 TH epitope cross-presentation by class II—that is, relative to that of CTL epitope presentation by class I (69). This study’s unexpected finding that a haplotype-restricted, B cell–overlapping TH epitope is required for MPER+ Ab induction raises an important question: To what extent are T and B cell epitopes involved in MPER+ Ab responses functionally linked? In the general context of Ab responses against vaccination to complex viruses, a degree of TH–B epitope proximity/linkage has been demonstrated previously, which can range from a requirement for TH–B epitopes to be overlapping, adjacent, or both—for example, as mutational and overlapping-peptide analysis of influenza-specific CD4 TH clones has shown (66, 67)—to the other end of the spectrum, for TH–B epitopes to be on the same viral polypeptide but in different regions, as suggested by comprehensive scanning of functional TH–B epitopes involved in neutralizing Ab responses to vaccinia immunization (73). Thus, understanding the degree of TH–B cell epitope linkage involved in MPER+ Ab induction may be important for minimal MPER immunogen design in two regards. First, assuming that such linkage applies equally to all MPER+ B cell epitopes (i.e., nonneutralizing and BnAb epitopes), a strategy to successfully re-engineer existing minimal MPER immunogens as TH–B (biepitope) immunogens, to enhance general TH responses, may specifically need to consider: 1) identifying whether or which gp41 regions (or portions of Env) contain alternate TH epitopes functionally comparable to the H-2d–restricted TH epitope, and 2) determining which ones can be presented by the widest array of haplotypes. Second, because successful minimal MPER immunogens will likely also need to be capable of preferentially binding BnAb epitopes, another consideration in their redesign will be to eliminate nonparatopic, non-neutralizing B cell epitopes or improve BnAb epitope sequences, or both. In this regard, the fact that the class II–restricted TH epitope we have identified overlaps MPER+ BnAb epitopes means that such re-engineering could also destroy critical residues in this overlapping H-2d–restricted TH epitope; therefore, identifying alternate functionally linked TH epitopes will be critical. One potentially important, related consideration for optimizing minimal immunogens that this study raises is to understand the mechanism by which TH restriction of MPER+ Ab responses occurs. One interesting clue in this regard comes from our comparison of TH epitopes predicted at I-A for the H-2b, H-2k, and H-2s haplotype congenic B10 strains, all identified in this study as non- or low MPER+ Ab responders. In particular, although H-2b and H-2k haplotypes present poorly at I-A—the former being a generally poor MHC presenter (74), the latter selectively poor for the MPER—the H-2s presents/binds a TH epitope at I-A with an affinity/certainty that is equal to the H-2d responder strain (Supplemental Table I). Importantly, however, the predicted TH epitope presented/bound by I-As contains the full 2F5 neutralizing epitope ELDKWA that is also associated with self-reactivity (33, 36, 75), whereas that presented by I-Ad lacks specificity for the gp41664 aspartic acid residue in the 2F5 neutralization epitope [also lacking and/or decreased in nonneutralizing Ab/nonparatopic footprints in mice (42, 48), as well as in the opossum version of the evolutionarily conserved, ELDKWA-containing autoantigen candidate kynureninase (75)]. Given this interesting disparity in the type of TH epitopes presented by nonresponder and responder haplotypes, it is tempting to speculate on two, non–mutually exclusive possibilities for how TH restriction of MPER+ Ab responses occurs: 1) certain MHC class II haplotypes (like I-Ak) cannot present TH epitopes in the minimal MPER immunogen required for MPER+ Ab induction, but could potentially present ones nearby in gp41 that are functionally linked to BnAb epitopes, and 2) during thymic development, TH epitopes presented at I-A by certain haplotypes (i.e., I-As) interact with and delete self-reactive T cell precursors. Thus, in addition to considering TH epitopes capable of presentation by multiple haplotypes, immunogen design may also need to select TH epitopes based on their lack of self-reactivity. Tracking the fate of developing CD4 TH cells in immunized H-2d and H-2d congenic strains (using TH epitope-I-Ad/I-As complexed dextramer reagents, respectively) should be helpful in examining both possibilities. Another important question our study raises is how class II–restricted TH presentation or deletion of CD4 T cells, or both, affect the subdominance of MPER+ BnAb responses. One possibility is that this occurs directly, via the same mechanisms we describe here for nonneutralizing MPER+ Ab responses in nonresponder haplotypes. Another possibility is that this occurs indirectly, in responder haplotypes, via either 1) further amplification of B cells expressing nonneutralizing epitopes that preferentially bind Env/MPER immunogens and/or are more frequent in the preimmune repertoire, or are preferentially activated, both by virtue of lacking self-reactivity (and thus not being clonally deleted or anergic, respectively) or 2) further dampening of any potential serum BnAb responses via steric hindrance at the Ab level, by nonneutralizing serum Abs specific for overlapping or nearby epitopes in the HR2 region (41). Our recent observations of Ab responses in the 2F5 KI system have features that support both possibilities. On one hand, that T-independent serum BnAb responses are elicited by vaccination with the TLR-MPER peptide-liposome conjugate immunogen in the 2F5 KI model (36), which was engineered on the C57BL/6 background (and thus bears a nonresponder [H-2b] haplotype), yet the same immunogen induces T-dependent (T-D) responses in WT strains bearing responder haplotypes in this study, argues for a direct effect on 2F5 BnAb T-D responses by class II haplotype restriction. On the other hand, we have recently also shown that spontaneous T-D BnAb responses in the 2F5 KI model are already profoundly limited in the preimmune (unimmunized) repertoire of residual, peripheral B-cells via loss of 2F5 MPER neutralization epitope binding (36). Because this loss is selective (i.e., it occurs predominantly in serum IgG/mature splenic B cell fractions, and does not affect lipid binding or polyreactivity), this suggests that it is driven by reactivity for host (self-) Ags mimicked by the 2F5 neutralization epitope (33). Thus, although determining whether I-Ab–restriction of T-D MPER+ Ab responses also affects MPER+ BnAb epitopes (i.e., in addition to nonneutralizing epitopes, and independent of effects that purifying selection against self-reactivity may impart on the preimmune repertoire) is beyond the scope of this study, comparisons of 2F5 KI (C57BL/6) mice with those backcrossed onto a responder haplotype-bearing background, as well as adoptive cotransfer of 2F5 KI and WT responder or nonresponder haplotype-bearing B cells into MHC congenic recipients, will be informative in this regard. Finally, it will be of general interest to determine how the biology of MHC class II haplotype restriction of gp41 MPER+ Ab responses to immunization, elucidated here in mice, relates to those in HIV-1–infected or vaccinated humans. In this regard, a preferential association of class II HLA- DRB1*13 and HLA-DQB1*06 allelic variants with strong, polyfunctional TH responses in HIV-1 infected elite controllers has been reported in a recent study (76), but the status and specificity of any potential BnAb responses were not reported, nor were MPER-specific TH or Ab responses evaluated. Regarding vaccination specifically, Ab responses in RV144 vaccine recipients (77) have been found to map to the V2 region, in close proximity or overlapping to V2-specific TH epitopes in responding CD4 T-cells (78). Furthermore, a preferential association of DRB1*11 and allelic variants with general non-Ab responsiveness, as well as that of DQA1*5:01 and DQB1*03:01 HLA-DQ heterodimers with a lack of weak (tier 1) neutralizing Ab responses, have been found in this same trial (79), thus suggesting haplotype restriction of responses to this vaccine regimen involving closely overlapping TH–B cell epitopes. Although currently no analogous functional or genetic associations have been made between class II–restricted overlapping TH–B epitopes and nonneutralizing/BnAb MPER+ Ab responses, it is tempting to speculate on their involvement, given the heterogeneity in magnitude and timing of α-gp41 nonneutralizing or weakly cross-neutralizing Ab responses (8), as well as the fact that a similar mode of action by which class II restriction of MPER Ab responses to immunization we see in this study in mice is also potentially involved in α-V2 Ab responses to RV144 vaccination (77–79). Assuming MHC class II restriction by overlapping TH–B epitopes indeed affects gp41 MPER+ Ab responses in vaccine recipients, we predict that the same mechanisms and considerations identified here would likely apply, because a similar distribution of TH epitopes (in minimal MPER immunogens) is predicted by the IEDB consensus database (80) across human class II alleles as those presented at I-A/I-E by haplotypes in MHC congenic haplotype nonresponder and responder groups. Functional mapping of TH and B cell gp41 MPER epitopes in vaccine recipients in future MPER immunogen-based vaccine trials, as well as examination of MPER Ab responses in mice bearing human MHC loci (or expressing relevant human class II allelic variant transgenes identified in such functional screens) may be informative in this regard. We thank Celia LaBranche for assistance with TZM-b/l neutralization assays, Kara Anasti for help with production and quality control of TLR agonist-MPER peptide-liposomes, Mattia Bonsignori for technical advice regarding 3H proliferation assays, the DHVI Flow Cytometry and Immune Reconstitution Facilities for expert assistance, Matt Holl and Garnett Kelsoe for helpful discussions regarding MHC class II prediction algorithms and in vitro restimulation assays, respectively, and the Duke Center for AIDS Research (CFAR), a program funded by the National Institutes of Health (5P30-AI064518). This work was supported by National Institutes of Health Grant R01AI087202 (to L.V. ), a Collaboration for AIDS Vaccine Discovery from the Bill and Melinda Gates Foundation (to B.F.H. and L.V. ), and the Center for HIV/AIDS Vaccine Immunology, National Institute of Allergy and Infectious Disease/National Institutes of Health Grant U19AI067854 (to B.F.H.).
. 2000. Protection of macaques against vaginal transmission of a pathogenic HIV-1/SIV chimeric virus by passive infusion of neutralizing antibodies. Nat. Med. 6: 207–210.
. 2009. Broadly neutralizing human anti-HIV antibody 2G12 is effective in protection against mucosal SHIV challenge even at low serum neutralizing titers. PLoS Pathog. 5: e1000433.
. 2010. Broadly neutralizing monoclonal antibodies 2F5 and 4E10 directed against the human immunodeficiency virus type 1 gp41 membrane-proximal external region protect against mucosal challenge by simian-human immunodeficiency virus SHIVBa-L. J. Virol. 84: 1302–1313.
. 2012. Antibody-based protection against HIV infection by vectored immunoprophylaxis. Nature 481: 81–84.
. 2011. Characteristics of the earliest cross-neutralizing antibody response to HIV-1. PLoS Pathog. 7: e1001251.
. 2009. Neutralizing antibodies generated during natural HIV-1 infection: good news for an HIV-1 vaccine? Nat. Med. 15: 866–870.
. 2012. Broad and potent neutralization of HIV-1 by a gp41-specific human antibody. Nature 491: 406–412.
. 2009. Broad neutralization of human immunodeficiency virus type 1 (HIV-1) elicited from human rhinoviruses that display the HIV-1 gp41 ELDKWA epitope. J. Virol. 83: 5087–5100.
. 2011. Heterologous epitope-scaffold prime:boosting immuno-focuses B cell responses to the HIV-1 gp41 2F5 neutralization determinant. PLoS ONE 6: e16074.
. 2010. Elicitation of structure-specific antibodies by epitope scaffolds. Proc. Natl. Acad. Sci. USA 107: 17880–17887.
. 2012. Prime boost vaccination approaches with different conjugates of a new HIV-1 gp41 epitope encompassing the membrane proximal external region induce neutralizing antibodies in mice. Vaccine 30: 1911–1916. 2011. Towards an AIDS vaccine: the transmembrane envelope protein as target for broadly neutralizing antibodies. Hum. Vaccin. 7(Suppl): 4–9.
. 2013. Neutralizing antibodies to HIV-1 induced by immunization. J. Exp. Med. 210: 209–223.
. 1989. Clonal deletion of B lymphocytes in a transgenic mouse bearing anti-MHC class I antibody genes. Nature 337: 562–566.
. 1991. Expression of anti-DNA immunoglobulin transgenes in non-autoimmune mice. Nature 349: 331–334.
. 1995. The site and stage of anti-DNA B-cell deletion. Nature 373: 252–255. 1992. B-cell tolerance. Curr. Opin. Immunol. 4: 703–710.
. 2013. Induction of HIV-1 Broad Neutralizing Antibodies in 2F5 Knockin Mice: selection against MPER-associated autoreactivity limits T-dependent responses. J. Immunol. 191: 2538–2550.
. 2013. Somatic mutations of the immunoglobulin framework are generally required for broad and potent HIV-1 neutralization. Cell 153: 126–138.
. 2010. Prolonged exposure of the HIV-1 gp41 membrane proximal region with L669S substitution. Proc. Natl. Acad. Sci. USA 107: 5972–5977.
. 2009. Challenges for structure-based HIV vaccine design. Curr. Opin. HIV AIDS 4: 431–440.
. 2011. Initial antibodies binding to HIV-1 gp41 in acutely infected subjects are polyreactive and highly mutated. J. Exp. Med. 208: 2237–2249.
. 2008. Initial B-cell responses to transmitted human immunodeficiency virus type 1: virion-binding immunoglobulin M (IgM) and IgG antibodies followed by plasma anti-gp41 antibodies with ineffective control of initial viremia. J. Virol. 82: 12449–12463.
. 2012. Lessons learned from HIV-1 vaccine trials: new priorities and directions. Nat. Immunol. 13: 423–427.
. 2010. Tiered categorization of a diverse panel of HIV-1 Env pseudoviruses for assessment of neutralizing antibodies. J. Virol. 84: 1439–1452.
. 2009. Enzymatic removal of mannose moieties can increase the immune response to HIV-1 gp120 in vivo. Virology 389: 108–121.
. 2005. Innate IL-10 promotes the induction of Th2 responses with plasmid DNA expressing HIV gp120. Vaccine 23: 963–974.
. 1999. HIV-1MN recombinant glycoprotein 160 vaccine-induced cellular and humoral immunity boosted by HIV-1MN recombinant glycoprotein 120 vaccine. AIDS Res. Hum. Retroviruses 15: 115–132.
. 1997. Adsorption to aluminum hydroxide promotes the activity of IL-12 as an adjuvant for antibody as well as type 1 cytokine responses to HIV-1 gp120. J. Immunol. 159: 2409–2417.
. 1994. Ability of HIV to promote a TH1 to TH0 shift and to replicate preferentially in TH2 and TH0 cells. Science 265: 244–248.
. 1994. The Th1-Th2 hypothesis of HIV infection: new insights. Immunol. Today 15: 575–581.
. 1984. The antigenic structure of proteins: a reappraisal. Annu. Rev. Immunol. 2: 67–101. 1983. T-B reciprocity. An Ia-restricted epitope-specific circuit regulating T cell-B cell interaction and antibody specificity. Surv. Immunol. Res. 2: 223–229.
. 1990. Relative positioning of the T cell and B cell determinants on an immunogenic peptide: its influence on antibody response. Biochem. Biophys. Res. Commun. 169: 803–808.
. 1987. Antibody conjugates mimic specific B cell presentation of antigen: relationship between T and B cell specificity. J. Immunol. 138: 4133–4142.
. 1987. The basis for the immunoregulatory role of macrophages and other accessory cells. Science 236: 551–557.
. 1985. The molecular basis of the requirement for antigen processing of pigeon cytochrome c prior to T cell activation. J. Immunol. 134: 3233–3240.
. 1986. T cell recognition of ragweed allergen Ra3: localization of the full T cell recognition profile by synthetic overlapping peptides representing the entire protein chain. Eur. J. Immunol. 16: 236–240.
. 1988. Mapping an antibody-binding site and a T-cell-stimulating site on the 1A protein of respiratory syncytial virus. J. Virol. 62: 4465–4473.
. 1991. Identification of T- and B-cell epitopes of the E7 protein of human papillomavirus type 16. J. Virol. 65: 4681–4690.
. 1989. The immune response of BALB/c mice to influenza hemagglutinin: commonality of the B cell and T cell repertoires and their relevance to antigenic drift. Eur. J. Immunol. 19: 515–521.
. 1989. The structural requirements for class II (I-Ad)-restricted T cell recognition of influenza hemagglutinin: B cell epitopes define T cell epitopes. Eur. J. Immunol. 19: 523–528.
. 1996. Immunogenicity of peptides for B cells is not impaired by overlapping T-cell epitope topology. Immunology 88: 348–354.
. 2010. Reverse vaccinology: developing vaccines in the era of genomics. Immunity 33: 530–541.
. 2004. Mapping of epitopes for autoantibodies to the type 1 diabetes autoantigen IA-2 by peptide phage display and molecular modeling: overlap of antibody and T cell determinants. J. Immunol. 172: 4084–4090.
. 1993. Conversion of an immunogenic human immunodeficiency virus (HIV) envelope synthetic peptide to a tolerogen in chimpanzees by the fusogenic domain of HIV gp41 envelope protein. J. Exp. Med. 177: 717–727.
. 2007. Application of machine learning techniques in predicting MHC binders. Methods Mol. Biol. 409: 201–215.
. 1998. Impaired antibody responses in H-2Ab mice. J. Immunol. 161: 1765–1771.
. 2010. HIV controllers with HLA-DRB1*13 and HLA-DQB1*06 alleles have strong, polyfunctional mucosal CD4+ T-cell responses. J. Virol. 84: 11020–11029.
. 2012. The Thai Phase III HIV Type 1 Vaccine trial (RV144) regimen induces antibodies that target conserved regions within the V2 loop of gp120. AIDS Res. Hum. Retroviruses 28: 1444–1457.
. 2012. The Thai phase III trial (RV144) vaccine regimen induces T cell responses that preferentially target epitopes within the V2 region of HIV-1 envelope. J. Immunol. 188: 5166–5176.
. 2012. HLA class II restriction of HIV-1 clade-specific responses in ethnic Thai recipients of the RV144 prime-boost vaccine combination of ALVAC-HIV and AIDSVAX B/E. Vaccine 30: 832–836.
. 2008. A systematic assessment of MHC class II peptide binding predictions and evaluation of a consensus approach. PLOS Comput. Biol. 4: e1000048.